Soak the bamboo skewers in water for at least 30 minutes. Cube the steak meat. Squeeze out the lime juice into a bowl. Thinly slice the hot chili peppers and lemongrass (if using fresh). Peel the garlic cloves. Devein kaffir lime leaves by cutting its primary vein away. In a food processor / blender, roughly chopped and mix well the following ingredients: coconut milk, lime juice, hot chili peppers, lemongrass, garlic, caraway, coriander, cardamom, soy sauce, kaffir lime leaves, and sugar. Coat the cube meat with this mixture. Skewer cube meat with the bamboo skewers. Refrigerate for at least 2 hours - overnight preferable - for the flavorings to be absorbed by the meat. On a hot grill, grill the beef satay until the meat doesn't stick onto the grill anymore when you move the skewers. For the sauce: roughly chopped hot chili peppers, yellow onion and lemongrass. In a food processor / blender, mix these 3 items with the shallots, garlic, candlenuts into a paste. In a small sauce pan over medium heat, heat up a bit of cooking oil. Add the paste, tamarind, lime/lemon juice, brown sugar, and peanut butter. Stir well until you have a cooked-oatmeal consistency. Add a little water if needed. 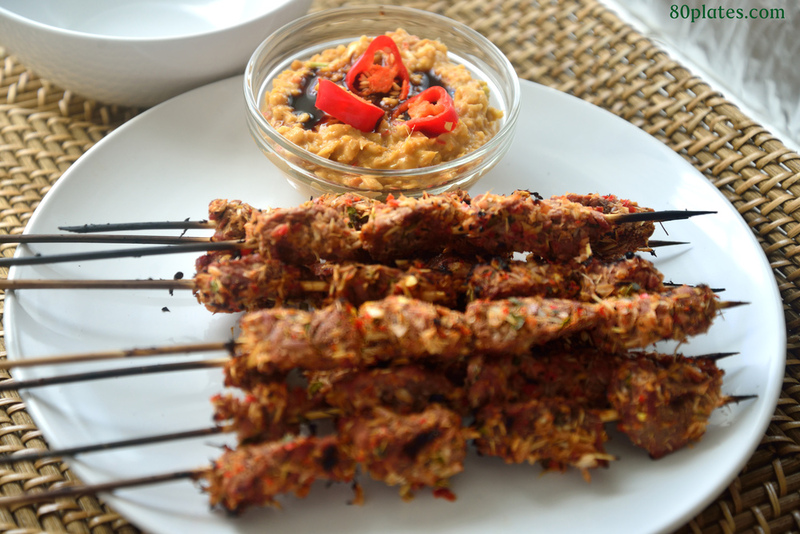 Serve the beef satay with the peanut sauce - yum!